It’s time to look at a classic romance film from back in the day. Like many iconic titles this one doesn’t hold up well though and instead serves as a cautionary reminder that you should always be careful when leaving the friend zone. Holly appears to be a rather suspect individual who is a bad influence from the start, but Paul is intrigued and determined to learn more about her. This begins the roller coaster of emotions for both characters leaving the viewer wondering if Paul would have been happier if he had stuck to his novels. The film starts with Paul moving to New York. He is ready to hit it big in the city, but has unfortunately forgotten his keys. Fortunately, he is able to get into the building and decides to try his luck with the neighbor downstairs. Holly lets him in, but her house is a mess and she’s half asleep. Paul immediately loses interest in making a call to get his keys and just follows her around the house listening to her life story. Fortunately his decorator shows up to save him. That night Holly shows up from the window at the dead of night and Paul fortunately wakes up in time to prevent himself from being robbed since she made a lot of noise. Still, she wants to be friends and Paul sees no harm in that. Can this pair really get things to work or are they doomed? Right away Paul should have seen the numerous red flags. For starters, Holly is used to using men for their money. All she cares about is being rich and she doesn’t mind doing just about anything to get higher social status. He learns this through her huge parties and how many crazy acquaintances she has. Holly even got married to someone in the south and he has come back to bring her home. He hears her insulting everyone behind their backs and reveals her true nature to him since they’re friends, but he somehow doesn’t think she does the same about him once he leaves. He gets pretty upset multiple times, but always comes back for more since she manages to apologize the next day. This is why the romance never works from the start. It’s really just him following after her the whole time when she simply isn’t interested. She does say she would be interested if he was rich, but he isn’t. You think there could be a twist where he is rich, but that would have made Holly look even more suspect if they had gotten together after that. As it stands, even in the final 5-10 minutes of the film she wants nothing to do with him and is constantly trying to push him away. She just has a change of heart in the final 2 minutes since she simply doesn’t want to be alone. This is not the basis for quick a quality romance is created. Furthermore, Holly is just a terrible character. Well, I’ve already explained most of the reasons. Her violent mood swings make her blame everyone but herself as well and this includes her cat. She leaves the cat stranded in a back alley while there is a downpour going on. Paul heads back for the cat after stopping for a few minutes to deliver a “harsh” but fake speech as he still immediately accepts Holly once she returns. They find the cat so at least that’s good but it can’t forgive that act of cruelty. Holly would not have gone back for the cat if Paul didn’t stop so her character was utterly irredeemable by this point. Holly’s supposed to be rather scatterbrained, but it’s taken to an extreme. She also appears to be very naive while also being portrayed as street smart in other aspects which doesn’t mesh very well. I can’t say Paul is a good character either though. For one, he’s quite nosy. He is ensnared by Holly way too quickly and even against his better judgment. Paul should have just left well enough alone instead of getting involved in her affairs. I still think more warning bells should have gone off when she broke into his house and this is exactly why you should bolt your windows if you have a fire escape. It’s just not safe. The film also juggles quite a few plots and background elements that don’t really go anywhere. We have the whole mafia angle where they are tricking Holly into delivering drug routes and secrets across the border. We’ve got this rich guy from Brazil who is interested in Holly although the film consistently hints that he isn’t actually serious and she would have been disappointed by arriving. He just sends a letter that the cops were too much for him. Then there’s also the case of land lord living upstairs. He’s definitely an intriguing character although one who certainly isn’t very smart at all. He should probably remove all of the safety hazards if he is going to constantly bump into them when he wakes up. At least he actually did call the cops and it wasn’t all a bluff. The guy just isn’t a likable character though and while he gets a few good lines and moments, it’s not really enough to sell me on him. The ex husband from Texas was also really random and out of nowhere. Maybe it was just there to set up the other relative dying later on, but we never even saw the guy so it’s hard for it to really come across as a very sad scene. If anything the whole situation just continues to make Holly look worse and worse. Particularly if the ex wasn’t lying and they did have a few kids (Adopted) waiting back home when Holly just ran off without a word. So much for maturity and responsibility eh? I suppose the writing isn’t bad. The dialogue is technically good even if the characters speaking the lines aren’t bad. The New York backdrop is nice to see as well. The library has certainly changed quite a bit over the years and I think I would have liked the old system of grabbing books quite a bit. Naturally it wouldn’t work in modern society with how many people are around and it would take forever to get all of the books but it’s pretty fun. That’s one of the fun parts about old films, getting to see what NYC was like back in the day. The parks certainly haven’t changed much. 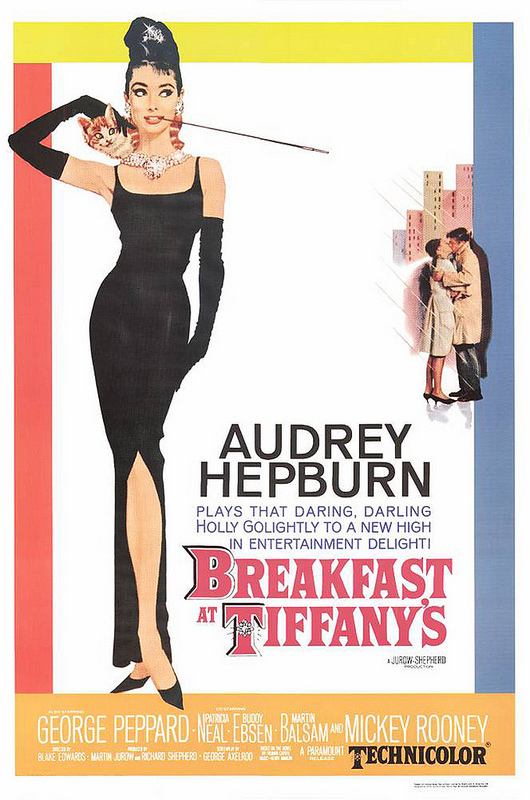 Overall, Despite the title, the characters never have breakfast at Tiffany’s. Just thought I should mention that in case you were waiting for a scene like that. This is a romance film where the romance isn’t handled particularly well at all. Holly just seems like a really terrible person who just causes a lot of grief for everyone and I can’t feel sympathetic for Paul because he absolutely knew what he was getting himself into. The scene where he fires his decorator was also rather odd as she didn’t even seem like a bad person. Maybe she was a little too friendly with him all the time, but he could have simply said something instead of just letting it happen the whole time. She seemed like a reasonable boss so the fact that he was so harsh with her the whole time seems like it comes out of the blue. I’d recommend staying away from this film. It’s not the quality entertainment that you will be looking for. Good romance films are hard to find but it’s worth grabbing those as opposed to seeing the dime a dozen ones like this title. This entry was posted in Live Action Movie Reviews, Live Action Movies, Reviews and tagged Breakfast at Tiffany's, Drama, Film Review, Movie Review, Review, Romance, Slice of Life, Tragic by dreager1. Bookmark the permalink.